TrueKnife TTT -|- Its all about being custom, mature, and for the community! I've been a bit spectical about posting here since I don't like advertising my server but it's been a bit hard for it to grow so why not? So what is TrueKnife TTT? We are a TTT community that aims to be unique and custom. I (My Dime Is Up) try to code everything custom. Even our donate page is built into XenForo (This was A PAIN to code but I learnt a lot about XenForo) along with a server tab showing players and their rank, and more. What things are custom and unique to TrueKnife TTT? Currently, we use Wyozi TTT Events but this is heavily modified. 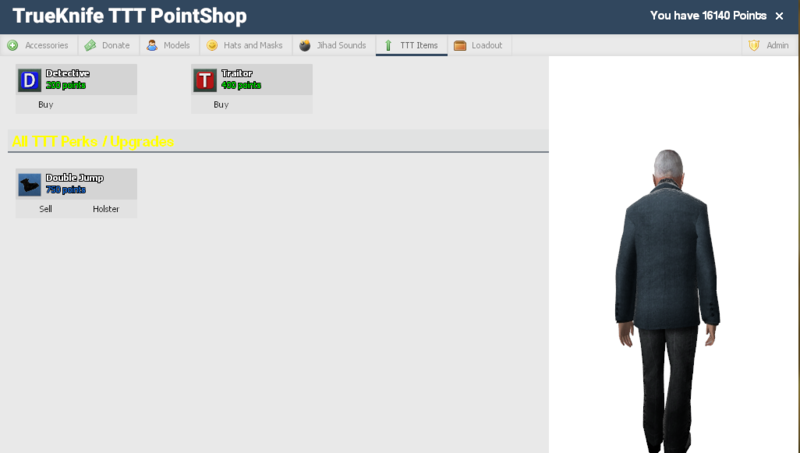 We are planning to move to a completely custom one later on until then we use Wyozi TTT Events. 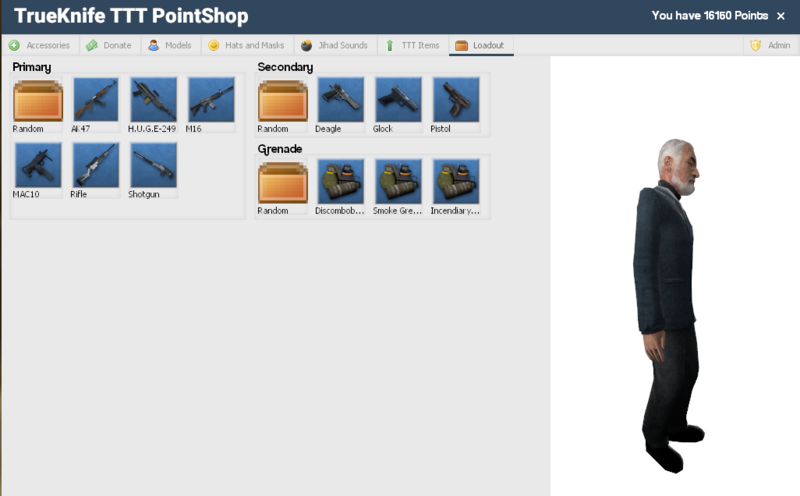 We have redone most of it like a HUD which will always stay until the fun round ends to let people know of the rules, pointshop rewards, and more. Currently, I and a friend have taken over the TTT Damagelogs project (With given permission from Tommy228). We have new autoslay support, a HUD with a message letting you know you have slays remaining and how many left so you know if you are ok to leave the server and shot logs on the old logs tab. This will be released soon to the public but until then, it is I who runs v3 publicly. 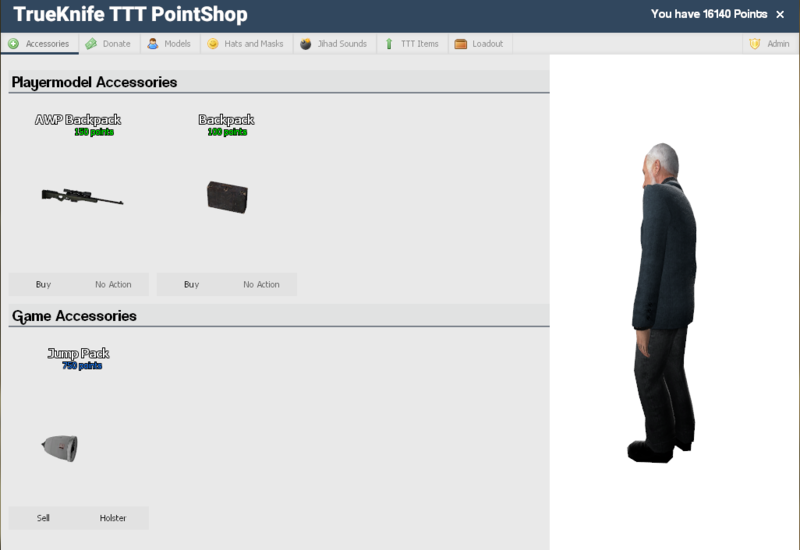 Our pointshop is still based on Adam's pointshop base but every tab is custom using a hook that comes with the Pointshop (This hook is not well known and isn't in the documentation). This allows us to have a custom tab layout for each tab making each category size and fit to what it is used for. There is more I can go on too but I won't. This post will receive a lot of editing later on as I am currently posting from my laptop which has a VERY touch sensitive trackpad while typing. I hope to see you on the server! Have a good day!